Specialized training for professionals who wish to acquire the skills necessary for leadership and management of education and training centers, with a clear focus on the analysis and promotion of innovation. This program was born out of the need of education professionals to acquire skills that help them develop, in an effective way, management and leadership tasks of education and training institutions. 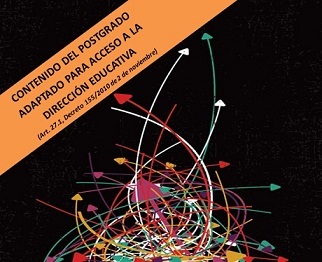 This program is not only addressed to professionals in a formal context, but also this program offers a sufficiently broad training that is able to satisfy both teachers seeking to access to leadership positions as well as other professionals who are developing management activities in the field of training or socio-cultural institutions with a clearly educational perspective. - Critically analyze and evaluate the regulatory framework and economic and administrative guidelines governing the operation of educational institutions. - Promote personal change in knowledge, skills, attitudes and skills of school principals related to the needs of your practice, the requirements of the immediate context and the educational system. - Use effectively the procedures and tools of leadership roles and leadership in educational organizations. - Develop a personal synthesis of the overall program management translating into projects. - Analyze organizations to discover dysfunctions. - Identify and critically evaluate alternatives for organizational improvement and performance management. - Plan and develop action plans policy to promote change and innovation. - Design and implement strategies and techniques of leadership, management and institutional management. University graduates with a minimum of 180 ECTS or equivalent professionally linked to both formal and non-formal educational institutions with expertise or interest in institutional management.